The Venue: At the confluence of 100A, 100B, Hartsdale Rd., Dobbs Ferry Road and Knollwood Road, in sort-of-Hartsdale, sort-of-White-Plains. A.k.a. where Mighty Joe Young’s once was. The Facts: As I’ve written on this blog before about Bar-&-Grills and Bistros, establishments focused on lunch and dinner often come up way short when attempting to serve fare earlier in the day. Usually, the “brunch” menu is almost exclusively “-unch,” with only a sauce-drenched egg dish and, if you’re lucky, a bland, limp, and pathetic french toast propping up the “br-” side of the meal. When I heard the steak house, Benjamin Steak House was enticing us to review their new brunch offerings via comped meals, images of soggy bread with the faintest whiff of vanilla began to fill my mind. However, beggars can’t be choosers, and while we didn’t beg for the free meal, the aphorism still applied. Fortunately, aside from Benjamin’s lacking the “Pastry Basket for Two” that Sylvia and Shelley attempted to order (Benjamin’s baker had not delivered the baskets that day), that fear was entirely unfounded, as Benjamin’s breakfast items were more than up to scratch, especially considering how good the schlag was. First, let me note the nice decor. While it’s a bit on the fancy side for a typical brunch (as one might expect), it’s perfectly cozy, especially with the fireplace burning off to one side of the room. Now, for the food itself. The WBC table as a whole did a very good job of ordering different items from each other, so as to get a fair sampling of the available fare. My own place setting was a microcosm of that. I ordered both a distinctly breakfast-y item, namely the chocolate chip pancakes, as well as a distinctly not-breakfast-y item, namely the lobster bisque. Though it drew some sideways glances and snide remarks from my fellow WBC’ers (and guests), there was a method to my madness: I was hungry, and like lobster bisque and chocolate chip pancakes. The bisque came first. It certainly wasn’t bad–I finished it all and scraped the bottom of the bowl with my spoon to get the final few splashes–but nothing special, and not worth the price in calories. It was altogether too thick and viscous, oozing over the spoon, rather than than flowing. The lobster flavor was a bit overpowered with saltiness. The color was pallid. Again, I enjoyed it, but I generally love lobster bisque, so if I merely enjoyed it, I can’t really recommend it to others who are less fanatic about the soup generally. My chocolate-chip pancakes came as sort of a “main course.” Whatever complaints I had about the bisque were more than made up for by the pancakes, especially when paired with the fluffy and delicious schlag. For those who may not know and for some reason read my review first, schlag is a kind of whipped cream, though that gives it far less credit than it deserves. Where whipped cream is normally just a garnish, schlag (at least Benjamin’s schlag) is more of a spread like jelly or marmalade. It is sweet without being cloying; you can eat spoons of it. It almost feels like a lighter, fluffier and warmer version of vanilla ice cream. It paired perfectly with the chocolate chip pancakes, as the latter provided a starchy base for the former to ride on, with the chocolate chips punctuating the flavor with hints of bitterness and salt. The pancakes themselves were nothing spectacular, but they were perfectly well-executed–not too thick, not too thin, good chip distribution–especially given the schlag pairing. Given what I had as my main, I passed on dessert, but I picked at Vanessa’s cheese plate and Whitney’s fruit plate, adding generous schmears of schlag to everything. Both those plates were well-executed, though I wish they had a more berry-centric fruit offering. The Verdict: Despite the distance and the (not unreasonable, but high for brunch) price, I would definitely come back here and strongly recommend it for others. It may be my first suggestion the next lazy Sunday when my parents are asking where we should go to get brunch. Assuming Benjamin continues offering brunch (there seemed to be a light turnout while we were there), it should definitely join the pantheon of Father’s Day and Mother’s Day locales, especially for families with older children. Benjamin Steakhouse is the place for a leisurely brunch on a special occasion, and its big beautiful fireplace makes it an elegant, but cozy winter spot. The assortment of brunch options was impressive for a steakhouse, and the group decided to divide and conquer the menu, no breakfaster able to choose the same entree as another. A pescetarian (vegetarian that eats fish), I decided to go all veggie and order the frittata with mushroom and goat cheese. I’m usually an early morning eater, so I was ravenous at our noon reservation. When my frittata arrived, I was initially disappointed that it wasn’t as big as a car tire. However, I found I was eventually satiated 3/4 of the way through and so glad I had room for dessert (the schlag!–but I am getting ahead of myself). The frittata is ideal for people who like simple, clean flavors. The eggs were fluffy, the mushrooms soft, and the goat cheese creamy. However, as I tasted some of the dishes around me, I realized that the simple frittata does not allow the Benjamin Steakhouse to show off its talents. I’ll definitely come back to the Benjamin to try the banana stuffed french toast and the crab cake. In all my years in Westchester, I’ve never been to Benjamin Steak House. I might as well start with brunch! Since the Steak House has only recently started serving brunch, we were not only the first to arrive but remained one of only a handful of occupied tables this morning. But I’m sure that will change once word of the brunch service spreads. Sylvia and I were ready to share a pastry basket for two ($9.95), but alas, our server informed us that the bread delivery hadn’t come in. I was torn between ordering an a la carte dish or ordering from the prix fixe menu ($21.95). In the end, I opted for the three-egg omelette from the prix fixe and selected a Bellini as my brunch beverage, foregoing the warm beverage (coffee or tea) that’s also included in the prix fixe. Because no potato was listed in the omelette description, I also ordered a side of fries ($5.00). The Bellini was refreshing, though very, very light on the peach flavor. I love prosecco, but this being a Bellini, I would have appreciated a bit more prominent peach taste in the drink. The omelette arrived and, lo and behold, there was a side of potatoes. I would have appreciated if the potatoes had been mentioned in the omelette description on the menu; I wouldn’t have ordered the side of fries had I known. But I was able to share the fries with the table, so all was not lost. The omelette was generous in size, well-made and well-cooked, with a generous and evenly distributed filling of cheddar cheese, peppers, onions, and ham. The potatoes were flavorful without being greasy, and I appreciated the fresh strawberry and orange garnish. Finally, I had to try dessert. I opted for carrot cake ($8.50), and made sure it came with a scoop of the schlag that we all came to love during the course of our meal. The carrot cake was a generous slice with a decent balance between the nuts, carrots, and frosting. 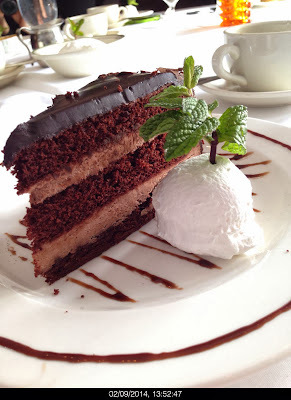 The schlag provided a refreshing balance to the cake as a whole. All in all, I was pleased by the quality of the meal and the friendly, informative service we received. If you’re not going to get a cocktail and a warm beverage, you may find it more economical to order an a la carte brunch item. But Benjamin Steakhouse is a beautiful, upscale setting in which to enjoy a high-quality brunch. And during the remaining weeks of winter, see if you can snag a seat by the fireplace for an extra cozy dining experience. Benjamin Steak House wanted us to try their brunch so much, that they invited us to come in and comp our meal. They also sent us a brief history of the steakhouse and a recipe for their Eggs Benjamin brunch dish. Of course I had to try the benjamin and eggs. Having been to Peter Luger steak house in Brooklyn, Benjamin Steak House does a pretty good job of replicating the ambiance of Peter Luger. The large (lit) fireplace at the end of the dining room is a nice touch. It is comfortable and inviting. 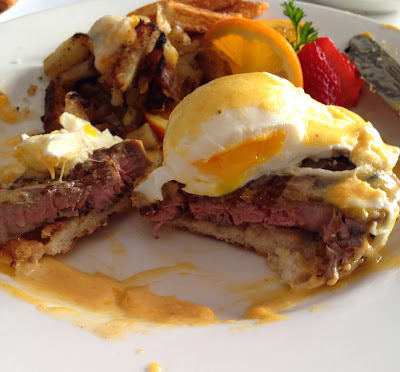 The Eggs Benjamin is basically eggs benedict with a fillet of steak. The reciepe they sent us called for a 1.5″ thick cut of steak. The steak that was served was not a 1.5″ thick cut of steak, or even a 1.5″ thick cut of steak cut in two. I don’t even think it was grilled at high enough heat, I prefer the outside to be a bit darker, and the inside to be a bit redder. They never did ask me how I wanted the steak done. Never the less, the steak was fine, texture was good, it was juicy, but most of the natural flavor of the steak was lost in the Hollandaise sauce. I couldn’t taste much of any pepper or salt. The poached eggs were cooked perfectly. Overall the dish was delicious and everything worked well together but the steak just didn’t pop. The whipped cream from Peter Luger is much more airy and fluffy, while Benjamin’s is more dense and also more flavorful. I prefer Benjamin’s schlag to Peter Luger’s schlag. Aside from the schlag, the cake was fantastic. All in all, a delicious brunch, great atmosphere. 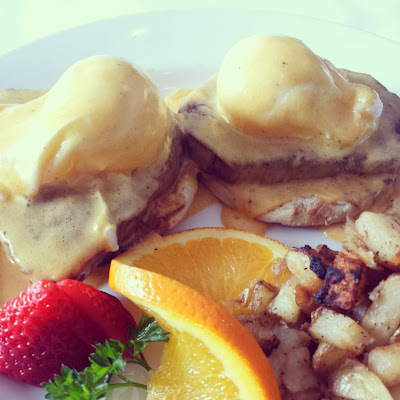 Have you ever gone to brunch at a Steakhouse-type restaurant and found that the only breakfast-type items on the “Brunch Menu” are Eggs Benedict or Quiche? When that happens, does it leave you feeling a bit let down? When I go to brunch, I’m looking for some generously portioned, sweet-meet-savory-meet-carbo-packed breakfast food. More specifically, pancakes and/or french toast. Sure, on any given day, I’ll go for an omelette, but really if pancakes and french toast (or some variation on those themes) aren’t being offered, I’m leaving one unsatisfied customer. Happily, Benjamin Steakhouse has got the breakfast goods, and they are yummy. I ordered the “Banana Stuffed French Toast.” First of all, I think calling it “stuffed” is a bit of a misnomer, as the thickly cut french toast wasn’t stuffed with anything. Perhaps if this dish were being served on a Chopped or Cutthroat Kitchen they would call it “Deconstructed Stuffed French Toast,” since the pain perdu (I know, I’m super fancy) was paired with fresh, sliced banana, a side of schlag (more on that in a moment) and a small cup of warm macerated banana in what tasted like a citrusy syrup. The french toast itself was perfectly good. The edges were crispy and the interior was soft and custardy (in a good way). Combining it with a slice of fresh banana and dollop of schlag made for one decadently delicious mouthful. Schlag! If you haven’t already read about this wonderful white stuff in the other reviews, schlag is stiff whipped cream. It’s really good and we Westchester Breakfast Club folks had a great time eating it by the spoonful. The only thing I could have done without was the cooked/macerated banana. Just not my thing, but also easily pushed aside in favor of the other tasty options that came with the meal. After the main course, despite being already being quite satisfyingly full, Vanessa and I shared a cheese plate and fruit plate. The fruit (strawberries, pineapple, and cantaloupe) was all fresh, and the cheeses were good enough. The cheese plate also came with warm toast. My conclusion; this was a very good brunch in a lovely restaurant. Benjamin’s will most certainly be a contender the next time I’m making Mother’s Day or Father’s Day brunch plans. The menu offerings for brunch included many of the usuals. There is the sweet and the savory. But nothing especially original or specific to the steakhouse. Well, only the Eggs Benjamin, which is an eggs benedict but with a couple of slices of steak instead of ham. I opted to go basic with two eggs over easy, with sausage (instead of bacon) and homefries. I also got a side of cheesy grits, because I do love grits. After a round of appetizers, our meals presented themselves. Our waiter had kindly given me both the bacon and the sausage to enjoy. The eggs were fried well that there was a crispy edge, but the yolk was still not fully cooked. The bacon was good. Salty and crisp. Still flexible and not cooked to within an inch of it’s life. The sausages were really good too. They were thin links, well spiced and also cooked to a nicely crisp exterior. Everything on the plate was executed well. The toast was soft and nicely toasted. The cheesy grits were well made and it was a very shareable portion size. Just a word of advice, give it a good mix when it arrives, lest you want just a layer of solid cheese to fight over with each scoop. What’s brunch without dessert? While what seemed that the popular Apple Strudel was sold out from Saturday’s busy dinner night, I settled on the Bourbon Pecan Pie. It was very good. What turns me off about pecan pies are that I find them tooth achingly sweet and the filling too dense. But this was not the case. It was sweet, but I was able to eat the whole slice without feeling like I was going into diabetic shock. The schlag helped cut the sweetness, and added a nice creamy component to each bite. Thank goodness they brought out three extra bowls of it! Benjamin Steak House does brunch! Let’s be honest, nobody knew! But they should know! And people should give them a try! Sadly, there weren’t a lot of people there for brunch. They open at 12, but we were there for a few hours and we only saw a few people enjoying brunch. So what did I enjoy? We shared appetizers. There was the prosciutto and melons, which I really enjoyed. 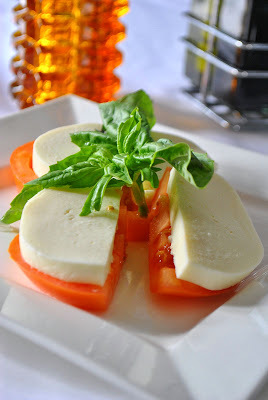 There was also mozzarella and tomatoes. Also delicious. For the main meal, I had the crab cakes with egg on top. The crab cakes were really good! The egg was slightly overcooked, but I think that’s to be expected with a large party. I also stole some fries and cheesy grits from some other people. All were good. The fries were definitely worth ordering. Dessert wise, I had my go-to Creme Brulee. I also added the house made schlag. Totally delicious. Overall, how did Benjamin Steak House do? Good! I wouldn’t go there with a large party. That might have attributed to the over cooked eggs. They may have been sitting under the heat lamp. Go with a smaller group, maybe four. Is it an every weekend thing? Sure! If you’ve recently won the lottery. I wouldn’t go every weekend, but I would go to give it a shot. The food was genuinely good. *Side note about the coffee: It must have been good coffee because I kept downing cup after cup. I kind of felt sorry for the guy that kept pouring it. I think he had to do it a dozen times. I had the craving for a light meal so I ordered the Chicken Caesar Salad. Caesar salad is an easy dish and can be found in almost every restaurant. It is an American classic, and it tells how much attention an establishment pays to the food they serve. Caesar salad can vary in its selection of ingredients and the preparation of it. I argue that it can vary from the use of Parmesan cheese, oil selection, freshness of the lettuce, and the lightness to the color of dressing. I wonder if Benjamin’s will produce an exceptional, acceptable, forgettable, or unapproachable basic Caesar salad. So far in my life, I only had one exceptional, many acceptable and forgettable, and a couple of unapproachable. For $12.50, what do you expect romaine lettuce with some dried up bread and dressing to be like? 1. Browning of the greens: NONE-good, it shows attention to the selection of the green. 2. Difficult to eat crotons: NONE-good, the inside of my mouth will not be cut up by harden bread. 4. Impressive dressing: Nope-it was a mild and light dressing with no zest. 5. Tender protein: YEP-two tender grilled chicken breasts that were seasoned with herbs and salt. The restaurant is good for a large party for brunch because it produces consistent quality food. Sometimes consistence is worth $12.50 for a chicken Caesar salad with a large party (it’s up to you to decide how you want to spend your money). 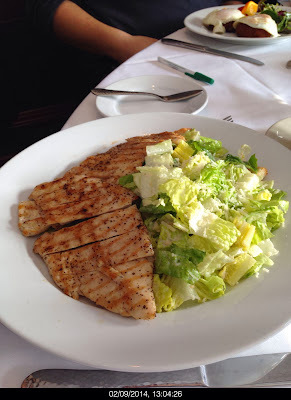 The Chicken Caesar salad is decent, but it is not the attractions to go to Benjamin’s Steakhouse for brunch.